It's Monday, time again for me to open wide the vast musical archives (which are actually quickly filling up my 30GB iPod - I think I need a new 60. Your favorite friendly music blogger is currently accepting donations) to pull out some selections for y'all. And today's caveat is that EZArchive (which stores the songs) may be acting weird. If you can't get the tunes, stop back by later. In the meantime I will give EZArchive a stern talking-to. I first heard this song done by Jeff Buckley on his Sketches (For My Sweetheart The Drunk). His version is saturated with a gorgeous and rich beauty (and was, incidentally, played at his memorial service - side note). Ben Harper also does a bluesy-gospel version with the Blind Boys of Alabama. But Johnny Cash, as always, puts his signature desolate and wind-blown sound to this song (from the Kill Bill 2 Soundtrack of all places) and it makes me feel all nostalgic and Grapes-of-Wrath-ish just to listen to it. 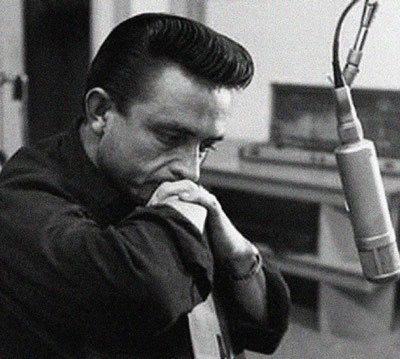 God bless Johnny Cash. I posted on Norway's Kings of Convenience before, but never about the lovely Canadian songstress Feist, who I have been hearing more and more professions of love for from the mouths of my musical friends. Feist paired with Kings for a few tracks on their album Riot On An Empty Street, released in 2004. This is a very mellow song with a nice blending of voices, with folksy finger-picking simple melody and lilting vocals. Check out "Homesick" from the same album for a straight up Simon & Garfunkel reunion. 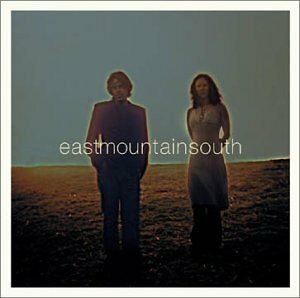 This duo has now broken up, but Eastmountainsouth was a lovely surprise discovery that I made in 2004, scoring free tickets to go see them in a small club in San Francisco. Kat Maslich is from Clinch Mountain, Virginia, and she joins Alabama/Tennessee native Peter Adams on their evocative eponymous 2000 release. Maslich's warm and powerful alto voice leads the album, alternating and meshing seamlessly with Adams. The organic and rural-sounding album employs a variety of styles of music, mostly centering around folk and acoustic melody, but incorporating hints of plucky bluegrass guitar and resonant piano. I highly recommend the album, and I wish you could still see them live as they were stunning. Oh, and this song was also featured on the Elizabethtown soundtrack last year. I just got reminded (by a little birdie of sorts) of this great track that I've had sitting in my "To Blog" playlist for about three months now. Matt Costa was was number three on Fader Magazine's "Top Ten Things You Didn’t Appreciate Enough In 2005," - an acoustic singer-songwriter in the vein of pal (and informal promoter) Jack Johnson. Costa has toured with Jack, as well as Donavon Frankenreiter (and probably G. Love), so you get a sense of his vibe. Costa also collaborates with Jack on the new Curious George soundtrack, which I buckled and pre-ordered on iTunes so I could get the excellent track "Upside Down," which makes we want to swing in a hammock somewhere. But, again, that's sort of off-topic. Sorry. "Sunshine" is from the 2005 album Songs We Sing. Check it out, you flip-flop-wearing surfer, you. Once again, I had something else here in the number 5 spot, but then I realized today's line-up was waaay too sparse and mellow and I am feeling a bit rockin' today myself. So let's rock a bit. I am getting all excited to receive the 2005 Pearl Jam Christmas Single vinyl. 'But it is January,' you say, 'not Christmas.' Well, in the 12 or 13 years as I have been in the Ten Club (the Pearl Jam fanclub), I don't think I've ever gotten the annual record before February. This song was featured on the 2003 Christmas single, and this Temple of the Dog "reunion" took place October 28th of that year at a star-studded evening of music. Thanks to Franz pointing this out: You can download this entire show at http://www.glidemagazine.com/downloads25.html. This amazing evening featured an acoustic set, and electric set, and three encores - filled with gems. 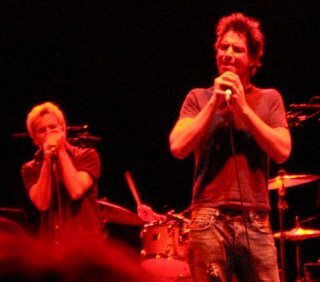 Collaborating musicians include Jack Irons, Chris Cornell (also did 2 solo songs, one of his own and one Audioslave), John Frusciante (RHCP), Jack Johnson, and Lyle Workman. Grab the show for download before it is gone! My favorite Seattle-ites are the topic of a new photo book coming out this Spring, "5x1: Pearl Jam Through the Eye of Lance Mercer." "Astair" is the best song on the Matt Costa album, IMO. And it looks like Feist will be playing in my hometown this year, at the Edmonton Folk Music Festival. Awesome. 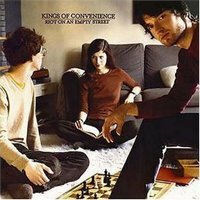 that kings of convenience song made me look up the entire "riot on an empty street" album and ive fallen in love with it.